Graduated from the State Russian Musical Academy named by Gnesins (PHD).Studied under Eugene Lieberman and lev Naumov. Awards: II prize and silver medal on the II International Piano Competition in Andorra; award of the recognition for the contribution of the young musicians development (American Protégé, New York). Performed numerous recitals in Russia, USA, France, Austria, Hungary, Belize, Caribbean islands, Andorra, Costa-Rica,South Korea, Spain as a soloist, soloist with orchestra, as a member of the different chamber ensembles. Many times was invited as an artist in festivals all over the world (Slavic music festival in Paris, I Piano Festival in San-Jose, Belize classical music festival & etc.). In 2012 participated in the honorable recital dedicated to Golden Anniversary of Her Majesty Queen Elizabeth II. Chairwoman of American Protégé Concerto competition (New York), jury member of the several international piano competitions. She has CD recordings with music of W. Mozart, F. List, F. Chopin, I. Brahms S.Prokofiev, C.Saint-Saens, F.Liszt – V Horowitz, E. Wild – G. Gershwin, E. Grieg – G. Ginzburg. 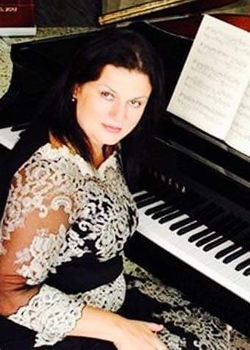 In July 2018 Irina was faculty member in I Petroff Piano festival in Hradec Kralove, Czeck Republic.